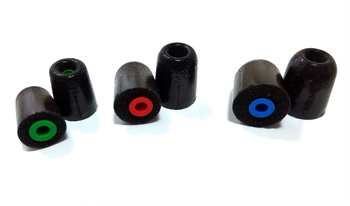 Comply® Canal Tips For Isolation Earphones are the original foam tips made by Hearing Components, but improved by offering three sizes and a much cooler black color rather than the peach color they originally came in. Canal Tips are the specified replacement for a variety of pilot headsets, communications headsets and for Isolation Earphones. If you use other replacement tips, the NRR ratings on earphones with noise reduction ratings (NRR's) may be compromised. Canal Tips have been discontinued, and we're liquidating what we have left. Don't panic - Westone Replacement Foam Tips are a great alternative. Just please note that the hearing protection from the Westone tips, while very similar, will not be exactly the same as with the canal tips. This is because your device was tested and rated with the Canal Tips, not with the Westone tips. Canal Tips Comply Tips For Isolation Earphones (Pack of 6 Tips - Black)5bpbFebruary 23, 2017These tips fir the EP10s perfectly and are usable many times, more times than standard foam or UPC roll-up plugs. They do a good job of keeping wind and mechanical noise down while motorcycling. Canal Tips Comply Tips For Isolation Earphones (Pack of 6 Tips - Black)5RobFebruary 18, 2013These tips work very well with my Shure E4s. They are very comfortable and the sound isolation is very good. Once I have used up this pack, I will be ordering another. No complaints. Canal Tips Comply Tips For Isolation Earphones (Pack of 6 Tips - Black)5EdDecember 7, 2011These tips are a perfect fit for comply headphnes. I love these headphones I can wear them all day with absolutly zero irritation to my ears.